LONDON--(BUSINESS WIRE)--Technavio analysts forecast the global polyester polyol market to grow at a CAGR of close to 6% during the forecast period, according to their latest market research report. Innovations in polyurethane (PU) is one of the major trends being witnessed in the global polyester polyol market 2019-2023. Research firms and other companies are constantly developing new forms of PU foams, including photo cross-linkable PU, to cater to the high demand for PU foams in several applications. Some innovations in PU include patent issued by KURARAY through its investors for highly durable polyester polyols. The patent states that PU can be used in paints, adhesives, coatings, elastomers, artificial/synthetic leather, foams, and resins cured by activation energy rays. Therefore, innovations in PU will drive the demand for polyester polyols during the forecast period. PU foam is extensively being used in several end-user industry verticals, mainly automotive, construction, and paints and coatings industries. PU foams are widely used in the production of automotive components such as wiper cowls, side skirts, bumpers, roll pans, and also interior components of cars such as including seats, armrests, headrests, dashboards, roof liners, and instrumental panels. PU foams are also used in the construction industry to form a layer of insulation, and it provides weatherproof sealants as well as helps cover irregular shapes. As the polyester polyol is one of the key ingredients used to manufacture PU foams, the surging demand for PU foams in the automotive and construction industry will fuel the growth of the polyester polyol market. The global polyester polyol market research report provides market segmentation by type (aliphatic polyester polyols, and aromatic polyester polyols), by application (C.A.S.E., flexible foam, rigid foam, and spray foam) and by region (APAC, Europe, North America, and ROW). It provides an in-depth analysis of the prominent factors influencing the market, including drivers, opportunities, trends, and industry-specific challenges. The APAC held the largest share of the market in 2018, accounting for about 52% share, followed by Europe, North America, and ROW respectively. The APAC region is likely to continue dominating the market with the highest incremental growth during the forecast period. 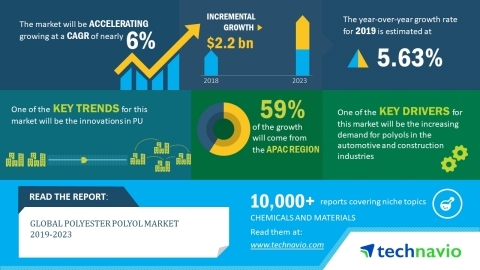 Technavio analysts forecast the global polyester polyol market to grow at a CAGR of close to 6% during the forecast period, 2019-2023.